This collection of fun graphics is perfect for your Valentine project needs. 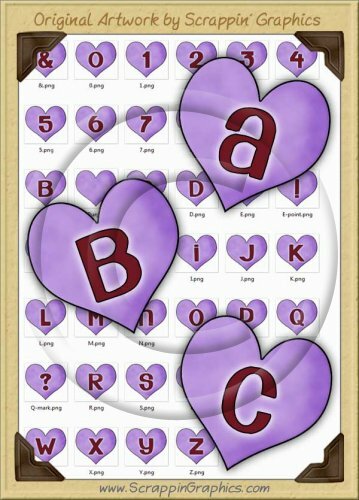 This set includes 40 different graphics of 26 red uppercase letters, 10 numbers, question mark, exclamation heart & ampersand stamped in Purple Candy Hearts. Also includes one blank heart. Great collection for web design, making scrapbook pages, cards, labels, tags, invitations, and other printables.